Arthritis hurts. But fresh cherries may help. Results of a preliminary study by ARS scientists and their university colleagues suggest that some natural compounds in plump, juicy Bing cherries may reduce painful arthritic inflammation. Eating cherries may also help lessen the severity of other inflammatory conditions, such as cardiovascular disease or cancer. Cherries already have a reputation for fighting inflammation. So what's new about the ARS study? "Our test is among the first to track anti-inflammatory effects of fresh Bing cherries in a controlled experiment with healthy volunteers," says chemist Robert A. Jacob, who led the investigation. Jacob is now retired from the ARS Western Human Nutrition Research Center in Davis, California. In previous studies at other laboratories, scientists analyzed extracts from sweet or tart cherries in vitro to learn more about the fruit's potential health-promoting properties. In contrast to these test-tube experiments, the California study is apparently the first to test key inflammatory disease indicators, or markers, in blood samples from healthy volunteers who were fed precise amounts of fresh Bing cherries. Reported in a 2003 issue of the Journal of Nutrition, the California investigation paved the way for a recent followup study at the Davis center. Davis, examine and weigh cherries. (K11171-1) Life—A Bowl of Cherries? Imagine being asked to eat a bowlful of 45 fresh, pitted Bing cherries for breakfast. Ten healthy women, aged 22 to 40, agreed to do that for the California scientists' preliminary study. Volunteers were instructed not to eat strawberries or other fruits and vegetables, or to drink tea or red wine, for the 2 days before the cherry breakfast. These foods are high in antioxidants, thought to fight inflammation. "They could have interfered with our ability to determine the specific effects of the Bing cherry antioxidants," explains Jacob. "Our main focus in this study was gout, a very painful form of arthritis," says co-investigator Darshan S. Kelley, a chemist at the nutrition center. "During gout attacks, crystals of a naturally occurring chemical, uric acid, accumulate in joints—commonly in the toes—and cause pain. Urate in blood plasma is a precursor of these uric acid crystals. So, we closely measured volunteers' levels of plasma urate. "We also indirectly measured the amount of urate that was moved out of the body in urine. We took blood plasma and urine samples before the volunteers ate the cherry breakfast and at intervals of 1-1/2, 3, and 5 hours afterward." Volunteers' plasma urate levels decreased significantly over the 5 hours after their meal of cherries. Levels of urate removed from the body in urine increased over those 5 hours. These urate results strongly suggest that cherries can play an important role in fighting gout. So do the results from the scientists' assays of some other indicators of inflammation. Significant changes in the levels of markers are an indication of a healthy immune system at work, attacking inflammation. 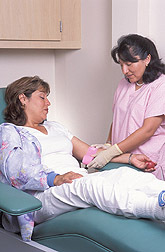 Markers monitored included C-reactive protein, nitric oxide, and tumor necrosis factor alpha. Another reliable sign of inflammation: the unwanted increase in nitric oxide. This biochemical is thought to play a role in damaging arthritic joints. The third marker, tumor necrosis factor alpha, is secreted in greater quantities when the body is fighting tumors that may induce inflammation. As is true for C-reactive protein, a healthy body that isn't fighting an inflammation has very little of this marker. At the 3-hour monitoring interval, C-reactive protein and nitric oxide were somewhat lower than at the start of the study. "Even though these levels were not significantly lower, the trend was in the right direction and so is of interest," notes Kelley. Unexpectedly, the scientists found no change in levels of tumor necrosis factor alpha. That's in contrast to a previous study, conducted elsewhere, in which natural compounds in fruits and vegetables were found to decrease levels of this marker. But the trends toward decreases in the other two markers do agree with results of other scientists' earlier, in vitro studies of cherry extracts. The follow-up study, conducted in 2003, involved more people, more cherries, and a greater array of inflammatory-response markers. Eighteen women and two men—aged 22 to 40—participated in the 64-day investigation. Many of the new volunteers began the study with elevated C-reactive protein levels. "That made it easier to detect any decline in C-reactive protein levels as the study progressed," says Kelley. "We're particularly interested in this protein because a recent major study indicated that it's more reliable than cholesterol as a predictor of cardiovascular disease. "This group ate the same daily amount of fresh Bing cherries as our earlier volunteers. But we asked them to eat the cherries throughout the day instead of just at breakfast." The volunteers did that for 28 consecutive days. The researchers are now analyzing blood samples. 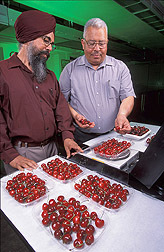 The grower-sponsored California Cherry Advisory Board helped fund the research. Final results should be available later this year. Then we'll know more about the health benefits of this sweet treat.—By Marcia Wood, Agricultural Research Service Information Staff. Darshan S. Kelley is with the USDA-ARS Western Human Nutrition Research Center, One Shields Ave., Davis, CA 95616; phone (530) 752-5138. 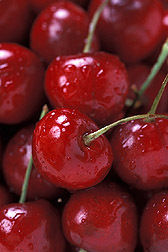 "Fresh Cherries May Help Arthritis Sufferers" was published in the May 2004 issue of Agricultural Research magazine.